On 4th May, BlueCrest witnessed a new breed of leaders take center stage. Mustafa Zakhari Nasomah and his team were administered the oath of office and induced as the Maiden Student Representative Council Executive Committee Members. Prof. Sunil Roy, the Rector of the University, mentioned that this was the fruit of the hard work of many Alumni and he said that it will be a day to remember in the History of BlueCrest. He encouraged the team to put in their best to serve the students. In his acceptance speech, Mr.Mustapha Zakhari Nasomah, shared a few of his team’s planned initiatives. Notable among them were the Open Forum, Discussion Room, Free Wifi Availability for all students, Sports Events, Sick Bay and Cafeteria. Students were very appreciative of the laudable ideas the SRC team was bringing on board. Elected Representatives of the Maiden Business Students Association were ushered into office under the able and efficient leadership of Mr. Derrick Nii Kpakpo Addo. The President Mr. Derrick Addo thanked the house and shared the team’s plan for the year. He said that the first program they were undertaking was the Business Students Association Week which was slated for 9th and 10th May, 2018. Students applauded the good news and received it warmly. The third event of the day was a donation by the Alumni board to the Alumni Secretariat. 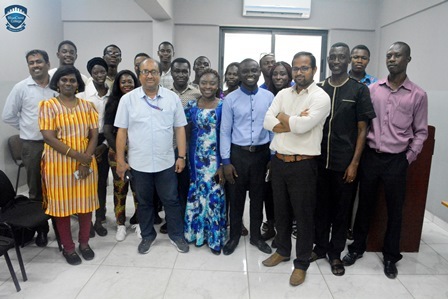 Mr.Nicholas Kwesi Tettey, the alumni Board President donated the computer along with other board members to the Rector Prof. S.K.Roy. Rector donated an undisclosed amount as Seed Money to the alumni. Mr. Nicholas Tettey commented that they have started afresh and the seed money will support them to move forward at a swift pace. Mr. Tettey also said they have been instrumental in the formation of SRC in the School. Students from other SRC from sister Universities were part of the audience. The whole program ended with a vote of thanks and the students proudly singing the BlueCrest Anthemwritten and composed by Mr.Wisdom Attaram. Mr.Sujith Jayaprakash, Prof.E.Balamurugan, Assoc.Prof.Eva Esther Shalin, Mr.Rajesh Kumar, Mr. Kofi Dzokoto, Mr.Anthony Quansah, Ms.Sreemoyee, Mr.John Kumi were present to witness the induction. Media was ably represented from Daily Graphic, Angel TV, Atinka FM, GNA, GTV, GBC Radio, Daily Search Light, Rite FM and Ghanaian Times.